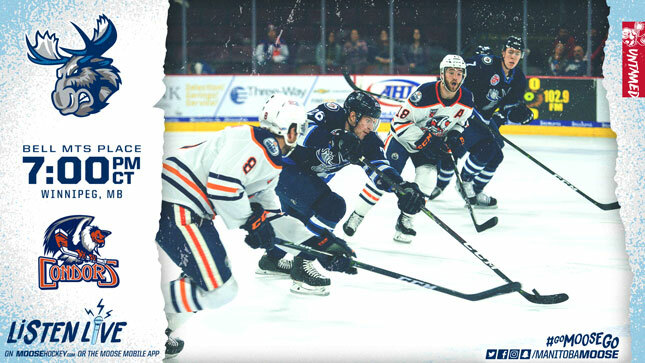 The Manitoba Moose (34-28-5-2) drop the puck on their final regular season homestand tonight with the Bakersfield Condors (39-18-3-2) visiting Bell MTS Place. The action begins at 7 p.m. CT and tickets are still available at moosehockey.com/tickets. It’s been nearly four months since these two teams have seen each other. Manitoba stopped in Bakersfield twice during their California trip at the start of December. The Condors shut out the Moose 4-0 in the first meeting, and topped Logan Shaw’s second career hat trick with four goals of their own in game two. Shaw might see an opportunity to break out of a slump in facing the Condors once again. Despite setting career highs in all offensive categories this season, Shaw has just four points (2G, 2A) over the last 16 games. The month of March was successful for the Moose (8-3-2-0) who sit two points behind fourth place in the Central Divison with games in hand. Surprisingly it was Ryan White who led the team with five goals last month. White has six points (4G, 2A) in his last seven appearances, and has been the emotional motor for Manitoba. In the previous two-game series against San Antonio, the veteran White and his linemates Cam Maclise and Hunter Fejes all found the scoresheet. The group combined for seven points (3G, 4A) against the Rampage. The Moose will need to beware of Cooper Marody who racked up four points (1G, 3A) in the games against Manitoba. The other challenge for the Jets’ AHL affiliate will be conquering Condors’ goaltender Shane Starrett who was in goal for the shutout Dec. 1 and has a 1.50 goals against average to go with a 0.947 save percentage in the two victories against the Moose. The Condors have locked up a playoff berth and are perched at the top of the Pacific Divison. Their calling card has been the league’s fifth-best power play (21.4%) although it dips when the team leaves Bakersfield (17.3%). Manitoba’s penalty kill unit should be up to the task. The shorthanded group has only allowed five extra man goals on 45 opportunities over the last 11 games. Tune in to Mitch Peacock and the pre-game show at 6:45 p.m. CT on moosehockey.com/listenlive/, the Moose App, and streamed live on AHLTV. The Moose and Condors meet once more tomorrow night before finishing off the homestand in back-to-back games against the Stockton Heat this weekend. For tickets to all the remaining games visit moosehockey.com/tickets.